This soup, adapted from The 150 Best American Recipes (and credited to Kathie Jenkins), turns leftover turkey into a satisfying meal-in-a-bowl. I love the earthy flavor of the combined rices and turkey, as well as the golden hue from the turmeric. In a large sauté pan, melt the butter and warm the olive oil. Add onion and sauté until translucent; add celery, carrot, and scallions or leeks, and sauté until vegetables have softened, about 5 minutes. Stir in turmeric and turn off heat. Meanwhile, in a large soup pot, bring the broth to a boil. Add the rice and reduce to a simmer. Add the sautéed vegetables and cook at a simmer until the rice is almost cooked through, about 30 minutes. Add the shredded turkey, mushrooms, half of the chopped dill, and extra broth or water if necessary (because the soup is too thick). Cook for another 10 to 15 minutes, until the mushrooms are cooked and the turkey is heated through. Season to taste with salt and freshly ground pepper. 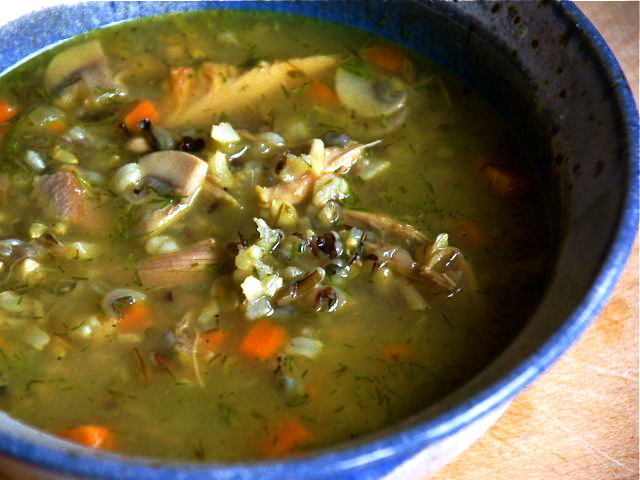 Ladle soup into bowls and sprinkle each serving with some of the remaining chopped dill.